I've been testing the trackplan for “The sidings”, and got a bit carried away! Jokes aside, there is a more serious side to this: As previously explained, the layout is inspired by the trackplan at the back of Gloucester Old Yard. This included the very short so-called “biscuit siding” which served a private warehouse through a kick-back arrangement. I'm a bit confused as to how gravitation could be done both "in an out". I wonder if pinch bars, horses and/or capstans were used in one direction? Or alternatively, as some have commented elsewhere, the wagons may have been gravitated in and then hauled back out by the loco itself. In any case, my initial reaction was to disregard these practices on my layout (which is not a direct copy of Gloucester anyway) and simply shunt the siding with a loco. I have made provision for this in the track plan and may still end up with that solution. Still, I couldn’t help toying with the idea of some form of non-loco wagon propulsion in that particular siding. The video above demonstrates my most succesful experiment so far. There’s a magnet stuck to the underside of the wagon and another in my hand underneath the baseboard. I thought I’d test it just to give it a try. The magnets are MSE and work quite well through my foamboard baseboard, as long as the wagon is not too heavy. Still, I have my doubts: The video shows manual operation where starts and stops can be done fairly gently. 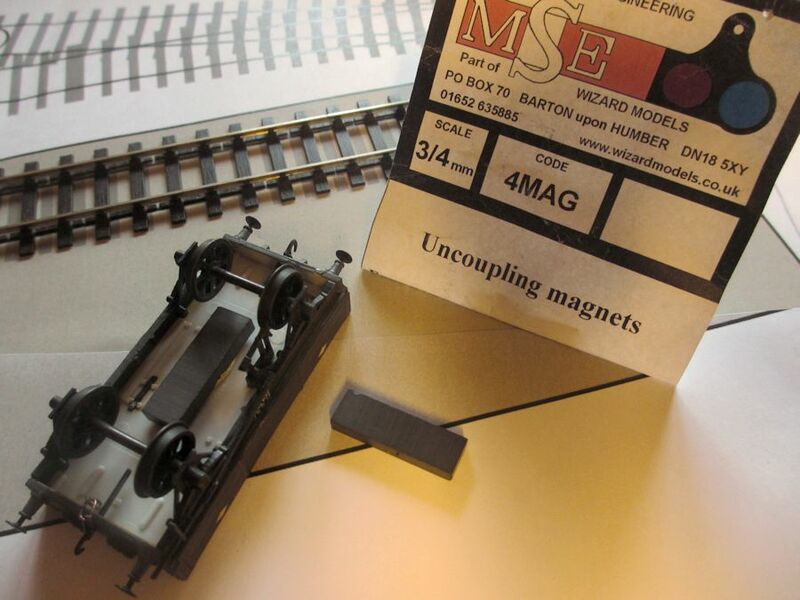 However, to make it practically feasible some sort of permanent, mechanically sliding magnet would be needed, and in such an arrangement it would be tricky to avoid sudden starts and stops, I think. So what are the alternatives? High Level do a mechanism for powering individual wagons, which looks interesting. It is illustrated in operation on the rather superb Leicester South layout here (from ca 6.17). To be honest though, I can't help feeling that it must be a little odd to control a wagon as one would a loco. I've therefore decided to instead explore the most prototypical option, ie building a slight gradient into the layout so that I can gravitate wagons into the biscuit siding. The loco can then take them back out.